Around the outside edges of the Shops space are stalls with self-serve vendors. Find a villager who is "For Hire" and trade them 9 diamonds. Shopkeepers won't move very far from where you place them, and if they are pushed around will always spring back to where they were placed. Each Shopkeeper need a double chest near by that is "theirs." They do not need to be placed on top of the chest. Please have them very near to where you want your shopkeepers to be. The Mod helping you will need to break that chest and replace it; do not be alarmed. All items that you are selling, and all items you receive as payment, will go into this chest. Once you have all of that information, go to your shop plot and ask for a Mod to come and help you. When your Shopkeeper is first made their trades will be empty since you have not told them what to sell yet. 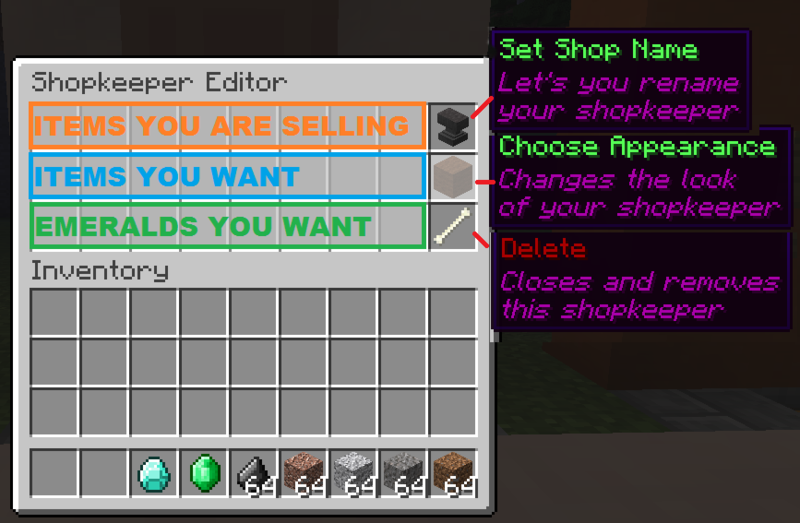 This is your Shopkeeper Editor menu, each space in the menu is used to tell the Shopkeeper what items to sell or what to charge for those items. You get to the menu by shift(crouch)-clicking on the Shopkeeper. NOTE: With the Change Appearance button you can change your villager type or switch between Skeletons and Wither Skeletons (need high ceilings). Changes you make to your wolf or ocelot will reset. You will need to put the items you want the Shopkeeper to sell into the chest but keep one of each item you are selling in your personal inventory. Once you have done that, the items you are selling will appear in the Shopkeeper Editor. 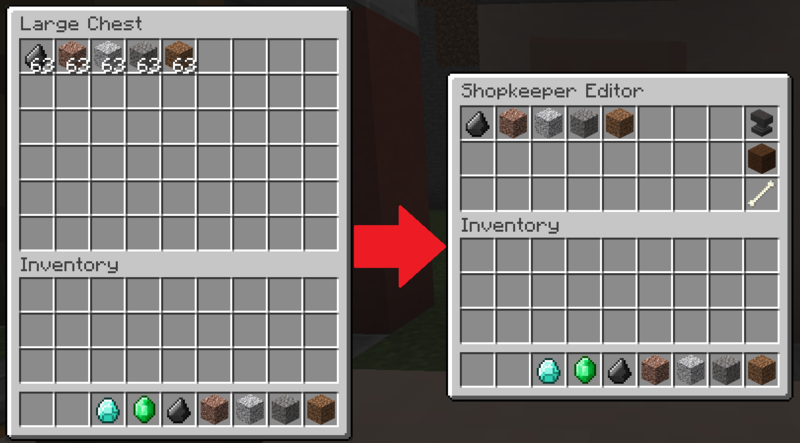 If you want to sell more than one of an item, while you are in the Shopkeeper Editor you left-click on the item in the Shopkeeper Editor. Do not click and drag. If you place too many into your Shopkeeper Editor you can right-click on the stack to remove them, one by one. Decide what you want to sell your items for. You must have at least one of each of the items you would like to receive in your inventory.In this example I am using diamonds only, but you can use any item except emeralds. The cost of each item is placed in the row under the item for sale. Left-click the items in your Inventory and then the boxes in the Shopkeeper Editor. If you also want to charge emeralds, that cost is placed in the row under the other cost. - If you run out of an item for sale in your chest, the Shopkeeper will no longer display it. If you add more of that item, the Shopkeeper will sell it again. This is not the case for unique items such as enchanted equipment or books. You will need to set up the trade for each new item. Thanks Merga! Glad you could inform us!